In the current issue of The Paris Review our Southern Editor, John Jeremiah Sullivan, writes about the discovery of an elaborate prehistoric cave-art tradition in, of all places, Middle Tennessee, and about the archaeologist Jan Simek, the onetime Neanderthal expert who leads the research on these remarkable Native American sites. By a stroke of good timing, this month also marks the U.S. premiere of the German director Werner Herzog’s Cave of Forgotten Dreams, a spellbinding 3-D documentary about La Grotte Chauvet, a cave in the south of France—discovered only in the mid-nineties—that contains exquisite animal paintings more than thirty thousand years old (the famous images at Lascaux go back a mere seventeen or eighteen thousand years, by comparison; Chauvet is another Lascaux back from Lascaux). In the following Q & A, Sullivan talks cave art with two of the more interesting underground explorers of our time. Mr. Herzog, you mention in the new film that you were limited to very few days and hours of shooting in the Chauvet cave, because of the possible ill effects (mold and so forth) that too much human traffic could have on the fragile environment. Also you had very little crew, and were forced to keep the equipment light. How might the movie have been different, if you’d been given unlimited access? Constraints—which in this case were massive—are never really completely productive. However, I had to focus to the very essentials, and probably, with two or three times as much schedule available for me, the film wouldn’t have been much different. It has never, in my life as a filmmaker, made much difference how the constraints were. Technical constraints, schedules, you name it—they always have forced me to be quick and intelligent. One small thing, maybe, which keeps nagging me, is a sort of a scratched painting, the outlines of an owl. It’s very strange and mysterious, and unique, because you do not have depictions of birds in the Paleolithic caves—with one exception that comes to mind: Lascaux, where there is a bison apparently hit by spears. His entrails are coming out of his belly, and there’s a dead man on the ground, face up, and there’s a stick, and a bird on it, as if the soul of the man were departing him. A beautiful and touching image, but of course, a different cave, and something like 18,000 years later. The problem with the owl in Chauvet is that you can only film it properly with light coming from profile. And as we could not step beyond the confinements of a metal walkway that runs through the cave, protecting the floor, it would have been very difficult to move a light. Perhaps on some sticks we could have held something, and with quite some time and tricky arrangements, I could have made it visible. But I take it as it is. Left: the owl in the Chauvet-Pont-d’Arc cave; Right: a prehistoric owl from a Southeastern cave in the United States. Something that’s rarely mentioned, or rather rarely gone beyond mentioning, is the sheer skill level involved in many of these prehistoric paintings, the draftsmanship. You don’t get that good at drawing without practice. There must have been a culture, to produce this. Yes, it is fully accomplished art, and in thirty thousand years it doesn’t get any better. I keep wondering, were there—and I say it with necessary caution—were there professional artists? Of course not, but there seems to be some sort of a catalogue of imagery. 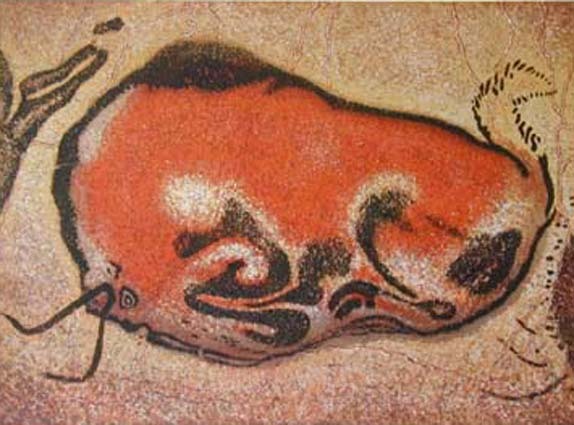 For example in Altamira, there is a crouching bison, a very beautiful painting—much later than Chauvet, ten thousand, fifteen thousand years later. Then a clay tablet was found, with pretty much exactly the same pose of the bison engraved into it. Now comes a wide question, which is not really legitimate, but I’m posing it anyway. Were there traveling artists, migrant or traveling artists, who would go from cave to cave, with some of the patterns in their pockets, recreating the bison? Because, you see, this type of bison was found in other caves as well. Of course I’m saying it almost as a joke, because it is a thought that comes completely from our perspective. The crouching bison in Spain’s Altamira cave. We do have a vast array of art mobilier for the Paleolithic. They’re decorating their tools. They’re decorating, probably, their clothing. Art may be far more invasive into aspects of their perishable material culture than we can see today. Bear in mind, too, they’re working with materials that are of the natural world, so they could practice on the ground, or on a bare space in the cave, and we’d never see it. Or perhaps they’re doing it outside, or on a tent cover. Look at documentation of Plains Indians tepee encampments. Those tepees were decorated from top to bottom. I think also of William Bartram riding into the Cherokee settlements in the eighteenth century. The cabins were painted on the sides with symbols that he doesn’t understand (we see the same symbols here in the Southeastern caves). It’s part of the magic of caves, I suppose, this power to preserve human things longer than they are supposed to last. It’s like driving a window the size of a phone booth back into the past, and attempting to see the landscape through it. The difficult thing is staying aware that it’s a much bigger phenomenon you’re trying to see on the other side, and it could contain anything. Anything humans are capable of could be over there. But the glass in the window is dark. This is what the five minutes of staring in Herzog’s film are about, to me. [Cave of Forgotten Dreams includes a remarkable extended sequence in which the camera gazes at the walls of the cave, letting the images soak in.] All of a sudden, in places like Chauvet or Lascaux, the picture on the other side of the looking glass is illuminated with a bright sharp light, and you are struck by what it is, by the level of detail and the power. You confront your own evolution in a very direct way. It was about silence, to sensitize the audience to silence, and to sensitize them as well to music. Perhaps an unusual form to do that. 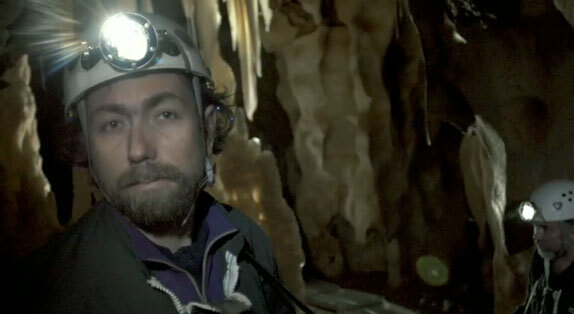 Apart from that moment, you don’t pay much attention to the discovery/exploration side of the Chauvet story, which is atypical in a movie about caves. Adventure doesn’t feel right anymore. And something doesn’t feel right with artists anymore, the whole term. If you look at contemporary figurative art, you can tell there is a crisis of the term there. There’s some reason to argue that prehistoric cave art—both in the Old and the New Worlds—tended to increase in frequency during periods of stress, whether it be environmental or social. If you look at the environmental data—a group of French researchers at the University of Bordeaux showed that the real pinnacles of at least some cave art production tended to coincide with glacial advances. If that’s true—and let’s say it’s a speculation at this point—what it reflects more than anything is that people get more religious when they’re under stress; it’s not the cave art that’s special, it’s the religious intensities that the increasing frequency of production reflects. Another example of the windshield back through time. Yes, it’s going on everywhere. Religion doesn’t play out in one place. That leads to something else you remarked on, Dr. Simek, about the new film, which is the subtle attention paid to place, to the immediate landscape around the cave. I know that in the case the North American sites, you’re finding that they must be understood within the context of the landscape—the land itself was seen as a fabric charged with mythological power, and the caves have a place in that. 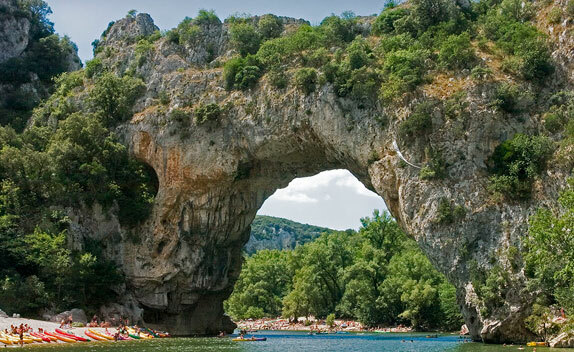 I was noticing the Pont d’Arc, the famous natural stone bridge over the Ardèche. (We have these “natural bridges” here in Tennessee, too.) A lot of Herzog’s interviews with scientists were done in front of the arch; they’re standing in front of it. The remark is not far-fetched. There’s evidence of six or seven caves in the immediate vicinity of the Pont d’Arc. And the bridge really does appear, as I remark in the film’s commentary, like a staging out of a Wagner opera. Apparently this romantic sense of landscape does not belong to the Romanticists alone. It is something that is embedded in our modern soul. It’s apparently in the modern human souls of Paleolithic people as well. The Pont d’Arc near the town of Vallon-Pont-d’Arc in southern France. This romantic landscape we’re talking about is the karst landscape—limestone country. Coves and caves, waterfalls. And that is literally the setting, I suppose, of those nineteenth-century operas and paintings. Karst has immediate topographic relief. Karst landscapes are broken landscapes, so you can be up high and down low in a very short period. And karst by definition has caves, so you can be in the underworld. There’s a great deal of immediate variability. And so if you’re playing out a cosmic play, it’s a great place to do it. Yes, there is drama. It is a drama of formation. And inside the cave, the drama continues. They utilize the formations. For example a bulge in the wall is now the neck of a bison charging you. A horse is cautiously coming out of a deep niche. So I think there was a clear understanding of drama, of the interior formation of the cave. The cave itself is in 3-D, in other words? Yes, and for this reason the film had to be made in 3-D. Of course, it had to be done for another reason. I do believe that for a long time to come, my film will be the only film to be made in this cave. The climate in the cave is too fragile, too precarious, you just don’t allow too many people into it, otherwise you will see problems that you had for example in Lascaux, which had to be shut down. Altamira in Spain had to be shut down for good. Dr. Simek, in the voiceover to this film, Mr. Herzog describes the cave art as a kind of proto-cinema or ür-animation. I’m wondering what you make of that, as an anthropologist. Our whole approach in the way we’ve gone about trying to understand the caves in the Southeast is based on paradigmatic work that was done in Europe: André Leroi-Gourhan, who studied the composition of caves, and who was the first to argue that on a pan-continental level these caves comprise stories, that they’re more than the individual pictures. The Abbe Breuil before him focused on the individual pictures; Leroi-Gourhan saw movement, saw structure, saw thought, saw gestures. His great archaeological work was called, essentially, “Idea and Gesture.” What he’s looking for, Leroi-Gourhan—and he of course is an intellectual disciple of Lévi-Straus—what they’re looking for is the cinema. I think Herzog’s exactly right—especially in the religious realm, people don’t operate by individual images. Churches are not snapshots. Churches are the stations of the cross. That’s what these caves are. They’re to be moved through in time, and experienced. 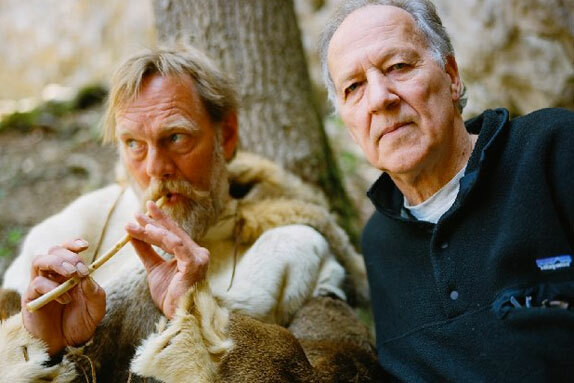 Was there anything you wanted to see more of in Mr. Herzog’s film? Not much, but I would have tried to show a little bit more than he does about the floor, what was on the floor. There is an archaeological site in that cave. There are some archaeological excavations near the ancient entrance, but more or less test probing. Archaeologists probably will have to work for decades. Today it goes millimeter by millimeter, every grain of sand is measured with laser precision, and documented, and it’s an extremely slow procedure, and they think they will do it in the next fifteen years. My prediction is they will dig there—and dig is a euphemism—they will work there for the next three decades. Of course, finding traces of human presence is more promising close to the entrance, to the now-buried entrance, under hundreds of tons of rock. Inside the cave there are no traces of human beings, with the exception of course of the paintings, and the footprint of probably an eight-year-old boy, and swipe marks of torches. Herzog with Wulf Hein, an experimental archaeologist. Nonetheless we know something about who these people were. We have Aurignacian jewelry, Aurignacian sculpture, and musical instruments. [Cave of Forgotten Dreams includes an interview with the “experimental archaeologist” Wulf Hein, shown dressed in a reindeer-skin jacket and playing a reconstruction of an ancient flute, found in a German cave.] Don’t forget, these are the people who are wandering the earth with Neanderthals. They’re not the only Hominid on the landscape. It’s very hard for us to imagine, because we have never had this experience, but at several times, most critically very early in our evolutionary history—but then again in Europe between forty and twenty-five thousand years ago—humans could look across the landscape and see a person coming toward them at a distance, and not know for sure that it was their own species. That’s psychologically a different world than the one we live in. And of course, new findings suggest that there was some sort of mixture of human and Neanderthal genes. They seem to be something like 3 percent of our genome. The findings are still not fully substantiated, but all indications at the moment speak for it. And maybe Neanderthal man was robbing women from Homo Sapiens. It could be. Or vice versa. Going out and robbing women you find all the way up until early Roman times, when young men went and carried off the Sabine women and married them. Until today we have a distant echo of marriage as basically robbing a woman, when you carry your wife across a threshold into your home. Many thanks to both of you. Mr. Herzog, would you mind telling us what you’re working on next? A new film, Death Row. That’s the title. I have filmed with Death Row inmates in Florida, most in Texas and one of them in Florida. In a way—how shall I describe it; I had a discourse in London, a public discourse, and the title of it was, “Filming the Abyss: Paleolithic Caves and Death Row.” In a way, both are looking deep into abysses. A cave is looking into an abyss of time that is unfathomable, or almost unfathomable, and filming on Death Row really was filming into the abyss of the human soul. The very first film I ever wanted to make when I was seventeen was about a maximum security prison in Germany. However I never managed to make the film. And I thank God on my knees that it was never done. The project was kind of immature. I’m glad that decades later I’m making a film which in a way was dormant in me for a long time. That’s what engages me at the moment. An except of Sullivan’s “Unnamed Caves” appeared on Slate in March. To read the entire essay, purchase the spring issue or subscribe.